A woman from Massachusetts has been sent to prison after she urged her boyfriend to kill himself over a number of text messages and phone conversations. Michelle Carter was found guilty of involuntary manslaughter for the suicide of her boyfriend, Conrad Roy. The incident happened in 2014, when Michelle was 17 and Conrad was 18. The young woman had been sentenced to 15 months in prison, but remained free during an appeal process which claimed her messages to Roy, pushing him towards suicide, were free speech, and therefore covered by the First Amendment. The Massachusetts Supreme Judicial Court, however, disagreed with this appeal, concluding that the claim ‘lacked merit’. The evidence was sufficient to support the judge’s finding of proof beyond a reasonable doubt that the defendant committed involuntary manslaughter as a youthful offender, and that the other legal issues presented by the defendant, including her First Amendment claim, lack merit. Roy tragically died in his pickup truck on July 13, 2014, from carbon monoxide poisoning. It was revealed in court that Carter ‘repeatedly chastised’ Roy for his ‘indecision and delay’ in committing suicide, and how she made him promise to go through with it. The court also heard how, over phone calls and text messages, Carter had encouraged Roy to take his own life, despite getting out of his truck and trying to abandon his suicide attempt. CARTER: I think your parents know you’re in a really bad place. I’m not saying they want you to do it but I honestly feel like they can accept it. They know there is nothing they can do. They’ve tried helping. Everyone’s tried, but there is a point that comes where there isn’t anything anyone can do to save you, not even yourself. You said your mom saw a suicide thing on your computer and she didn’t say anything. I think she knows it’s on your mind and she’s prepared for it. Everyone will be sad for a while but they will get over it and move on. They won’t be in depression. I won’t let that happen. They know how sad you are, and they know that you are doing this to be happy and I think they will understand and accept it. They will always carry you in their hearts. CONRAD: Aww. Thank you, Michelle. CARTER: They will move on for you because they know that’s what you would have wanted. They know you wouldn’t want them to be sad and depressed and be angry and guilty. They know you want them to live their lives and be happy. So they will for you. You’re right. You need to stop thinking about this and just do it because over turning always kills, over thinking. CONRAD : Yeah, it does. I’ve been thinking about it for too long. CARTER : Always smile, and, yeah, you have to just do it. You have everything you need. There is no way you can fail. Tonight is the night. It’s now or never. [D]on’t be scared. You already made this decision and if you don’t do it tonight you’re gonna be thinking about it all the time and stuff all the rest of your life and be miserable. You’re finally going to be happy in heaven. No more pain. No more bad thoughts and worries. You’ll be free. It’s okay to be scared and it’s normal. I mean, you’re about to die. I would be concerned if you weren’t scared, but I know how bad you want this and how bad you want to be happy. You have to face your fears for what you want. CARTER : If you don’t think about it, you won’t think about failing. You’ll just do it and then thinking you’ll succeed. CONRAD : Right. That’s what I’m talking about. I read so much about failed attempts gone wrong that it’s gotten me discouraged. CARTER : Yeah, exactly, so stop doing that. There is more success than there are failures. CONRAD : Are you kidding me? CARTER : You have to look at it that way and people only fail because they have the same mindset as you. Thinking they’ll fail. CONRAD : I really want to believe you. CARTER : You can’t think about it. You just have to do it. You said you were gonna do it. Like I don’t get why you aren’t. CARTER : So I guess you aren’t gonna do it then. All that for nothing. I’m just confused. Like you were so ready and determined. CONRAD : I am gonna eventually. I really don’t know what I’m waiting for but I have everything lined up. CONRAD : Is it too late? I don’t know. It’s already light outside. I’m gonna go back too sleep. Love you. I’ll text you tomorrow. CARTER : No. It’s probably the best time now because everyone is sleeping. Just go somewhere in your truck and no one is really out there right now because it’s an awkward time. If you don’t do it now you’re never gonna do it, and you can say you’ll do it tomorrow, but you probably won’t. Tonight? Love you. CARTER : For what. Are you awake? CARTER : Are you gonna do it today? CARTER : Yeah, it’s less suspicious. You won’t think about it as much and you’ll get it over with instead of wait until the night. CONRAD : Yeah then I will. Like where? Like I could go in any enclosed area. CONRAD : Okay. I’m taking Holly for a walk. CONRAD : I don’t know why I’m like this. CARTER : Sometimes things happen and we never have the answers why. CONRAD : Like, why am I so hesitant lately. Like two weeks ago I was willing to try everything and now I’m worse, really bad, and I’m LOL not following through. It’s eating me inside. CARTER : If you want it as bad as you say you do it’s time to do it today. CONRAD : Yup. No more waiting. CARTER : Okay. I’m serious. Like you can’t even wait ’till tonight. You have to do it when you get back from your walk. CONRAD : Still being here. CARTER : I would never leave you. You’re the love of my life, my boyfriend. You are my heart. I’d never leave you. CARTER : I love you. CONRAD : Love you, too. CARTER : When will you be back from your walk? CONRAD : Like, five minutes. CARTER : Okay. So you gonna do it? CARTER : Well, I want you to be ready and sure. What does that mean? CONRAD : I don’t know. I’m freaking out again. I’m over thinking. CARTER : I thought you wanted to do this. This time is right and you’re ready. You just need to do it. You can’t keep living this way. You just need to do it like you did the last time and not think about it and just do it, babe. You can’t keep doing this every day. CONRAD : I do want to but I’m like freaking for my family I guess. I don’t know. CARTER : Conrad, I told you I’ll take care of them. Everyone will take care of them to make sure they won’t be alone and people will help them get through it. We talked about this and they will be okay and accept it. People who commit suicide don’t think this much. They just could do it. CONRAD : I know. I know. LOL. Thinking just drives me more crazy. CARTER : You just need to do it, Conrad, or I’m gonna get you help. You can’t keep doing this everyday. CONRAD : Okay. I’m gonna do it today. CONRAD : I promise, babe. I have to now. CARTER : Like right now? CONRAD : Where do I go? CARTER : And you can’t break a promise. And just go in a quiet parking lot or something. CARTER : Go somewhere you know you won’t get caught. You can find a place. I know you can. Are you doing it now? CARTER : Good because it’s time, babe. You know that. When you get back from the beach you’ve gotta go do it. You’re ready. You’re determined. It’s the best time to do it. CONRAD : Okay, I will. CARTER : Are you back? CONRAD : No more thinking. CARTER : Yes. No more thinking. You need to just do it. No more waiting. CONRAD : On way back. I know where to go now. CONRAD : A parking lot. There is going to be no cars there at 9:00. So that’s when I’ll be found. CARTER : Okay, perfect. When will you be home? CONRAD : Ten minutes. Ha ha, that’s perfect. CARTER : Okay. And, well, yeah, I don’t know. CONRAD : Like, I don’t want to kill anyone else with me. CONRAD : When they open the door they won’t know it’s odorless and colorless. CARTER : You’re over thinking. They will see the generator and realize you breathed in CO too. CONRAD : So should I keep it in the back seat or front? CARTER : In the front. You could write on a piece of paper and tape it on saying carbon monoxide or something if you’re scared. CONRAD : I was thinking that but someone might see it before it actually happens. CARTER : Well, wait, the generator is gonna be on because you’ll be passed out, so they’ll know you used carbon monoxide. Dead. It’s not loud is it? CONRAD : Not really, LMAO. CARTER : Okay, good. Are you gonna do it now? CONRAD : I don’t know. I’m stressing. CARTER : You’re fine. It’s gonna be okay. You just gotta do it, babe. You can’t think about it. CONRAD : Okay. Okay. I got this. CARTER : Yes, you do. I believe in you. Did you delete the messages? CONRAD : Yes. But you’re going to keep messaging me. CARTER : I will until you turn on the generator. CONRAD : Okay. Well, I’m bringing my sisters for ice cream. CARTER : So will you do it when you get back? CONRAD : Yup, I’ll go right there. CARTER : I love so much. CONRAD : Ha ha. What are you doing? CARTER : Nothing really. Just resting. CONRAD : Okay. Ha, ha I’m procrastinating. CARTER : Yeah, ha ha, I know. Are you back? CARTER : So it’s time? CONRAD : Oh, it’s been time. CARTER : Are you gonna do it now? CONRAD : I just don’t know how to leave them, you know. CARTER : Say you’re gonna go the store or something. CONRAD : Like, I want them to know that I love them. CARTER : They know. That’s one thing they definitely know. You’re over thinking. CONRAD : I know I’m over thinking. I’ve been over thinking for a while now. CARTER : I know. You just have to do it like you said. Are you gonna do it now? CONRAD : I still haven’t left yet, ha ha. CARTER : Okay. You can do this. CONRAD : Okay. I’m almost there. Judge Kafker stated that Roy was a ‘vulnerable, confused, mentally ill 18-year-old’, who was in a ‘weakened state’ at the time of his suicide. The judge added ‘she did absolutely nothing to help him’ and that there was ‘no doubt the defendant wantonly or recklessly instructed the victim to kill himself, and that her instructions caused his death. Carter was sentenced to two and a half years in prison, with 15 months to be served and the rest to be suspended. She will also serve a five-year probation period. Daniel N. Marx, an attorney for the young woman, told The Boston Globe that their legal team was ‘disappointed in the Court’s decision’. [The ruling] adopts a narrative that we do not believe the evidence supports. 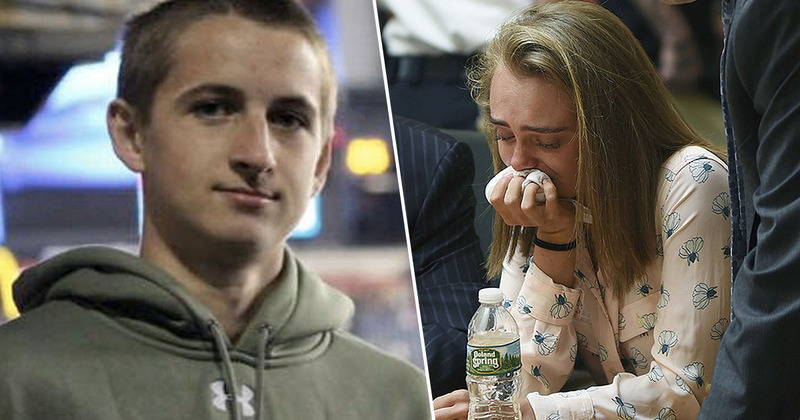 We continue to believe that Michelle Carter did not cause Conrad Roy’s tragic death, and she should not be held criminally responsible for his choice to end his own life. Today’s decision stretches the law to assign blame for a tragedy that was not a crime. The attorney added his team will ‘evaluate all legal options for Michelle including a possible appeal to the U.S. Supreme Court’.